Rose Library Blog | Exploring Race Relations from the South African Collection at the Rose Library. Exploring Race Relations from the South African Collection at the Rose Library. John Wamwara (SJD Candidate, School of Law) is 2017 – 2018 Newton Teaching Scholar at the Rose Library. He is supporting the Rose Library Faculty Fellowship program and is reviewing the Rose Library’s collections on Africa. His doctoral research is on how law, religion, and culture have shaped the monogamy – polygamy debate in Kenya; and how this relates to the global debate on legalizing plural marriages. So, what does the Rose Library offer for those interested in African Studies research? Or better still, where might one begin research within the Rose Library’s collections on Africa? 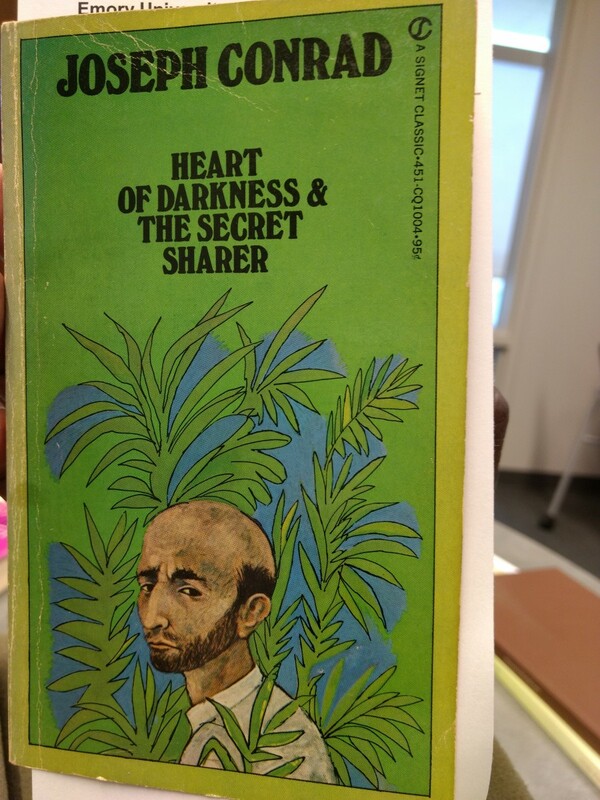 Cover of Joseph Conrad’s Heart of Darkness novella one of the early books (1898) telling of the barbarity of the African ‘enlighters’ in African hinterlands. Well, let me offer quick answers to these questions. 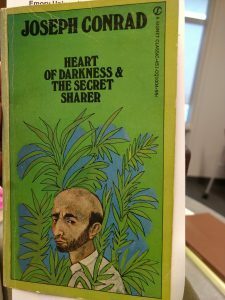 First, the Rose Library offers an ever-increasing collection of rare books and manuscripts on African literature, anthropology, religion, philosophy, and politics. This collection covers the length and breadth of the African continent from the Cape of L’Agulhas to the South, to the Strait of Gibraltar to the North; and from Ponta do Sol to the West, to Trou d’Eau Douce to the East. Secondly, you do yourself much justice if you start with the South African collection. The South African material is the most expansive of the African collections. This is partly because of the over 500 years of Western civilization’s uninterrupted presence and interaction with African cultures since 12 March 1488, when the Portuguese explorer Bartolomeu Dias docked at what he called Cabo das Tormentas (present day Cape Town). Secondly, it is in South African materials that the clash of civilizations is best exemplified – Christianity meets and duels African Traditional Religions; while race, color, identity, and philosophy also gets their time to square it out. Peter Abraham’s Song of the City, one of the first novel in English by a ‘native’ African provides a preview into race relations in South Africa. The South African collection introduces you to a continent in conflict. It presents to you a continent that that remembers its past, contends with its present, and fears for its future. Through the witness of Christian missionaries, Western explorers and adventurers, settler communities, administrators, and testimonies and works of the literate native Africans; one comes to the reality that the African past is lost. It has been conquered by a more powerful adversary – an adversary that has disenfranchised the native peoples of everything. It has declared barbaric, every aspect of being African offensive to the Western sensitivities and religion. It has declared that the foot soldiers of this adversary – the Western man/woman – are superior to the African race. It has grabbed all the African natives’ land and displaced the African communities. While the rivalries between the European races manifest through the many wars that the Boers (Afrikaners) and the British fight; these differences dissipate (more easily than they form) in the unity needed to enforce the supremacy of the white race. 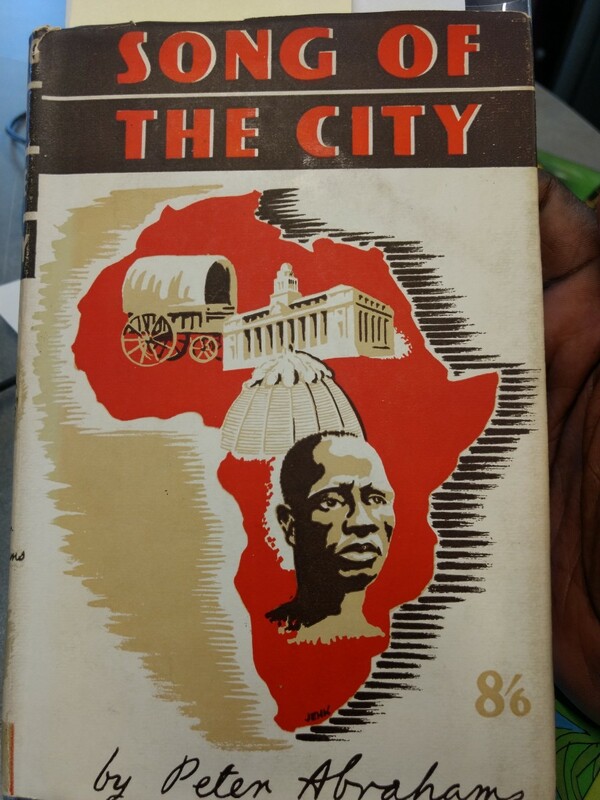 For this first post in a series on African related materials in Rose Library, I will focus on published works related to South Africa. This novel exemplifies the battle of the races in South Africa even before apartheid. No one else illustrates the conflict of the races in South Africa better than Peter Abrahams. He was born of an Ethiopian father and a Colored mother. (In South Africa then, people were either White, Colored, or Native.) He depicts White as a superior race, powerful, ruthless and entitled to every good thing. The Coloreds, though they are a product of secret liaisons between the Whites and Natives, the White do not accept them; while they look down upon natives. They are therefore lost between two worlds – beholden to Whites, and pridefully disdainful of the Natives. The Path of Thunder aptly illustrates the struggles of common people as they contend with the normative assumptions of their society and time. The tragic love stories of Lanny and Sarie; and that of Mad Sam and Sarie paint a grim picture of a society deeply rooted on racial prejudice. In both stories while the individuals loved dearly, the White society could not tolerate this love’ ending in the deaths of these love birds. 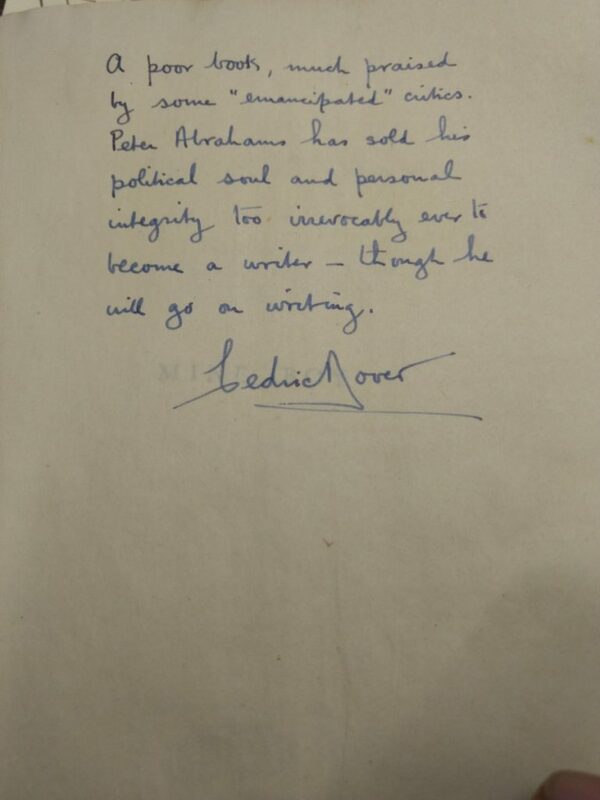 Cedric Dover’s comment after reviewing Peter Abraham’s book Mine Boy. Many of the works by Peter Abraham come from the library of Cedric Dover. Mr. Dover was also of mixed ancestry (English father, and Indian mother) who studied zoology, botany, and anthropology majoring in scientific study of the races. He wrote the books Half-Caste (1937), Know This of Race (1939) and Hell in the Sunshine (1943). Below Dover has tipped in a personal reflection of Peter Abrahams’ work and even includes a story of his first-time meeting Peter Abraham. Note the sarcastic title ‘St. 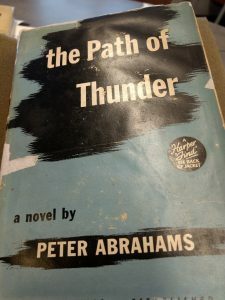 Peter Goes Down the Mine’ – this sarcasm and wit is found throughout his reviews of Peter Abrahams’ work and present in most works within the Dover Library. 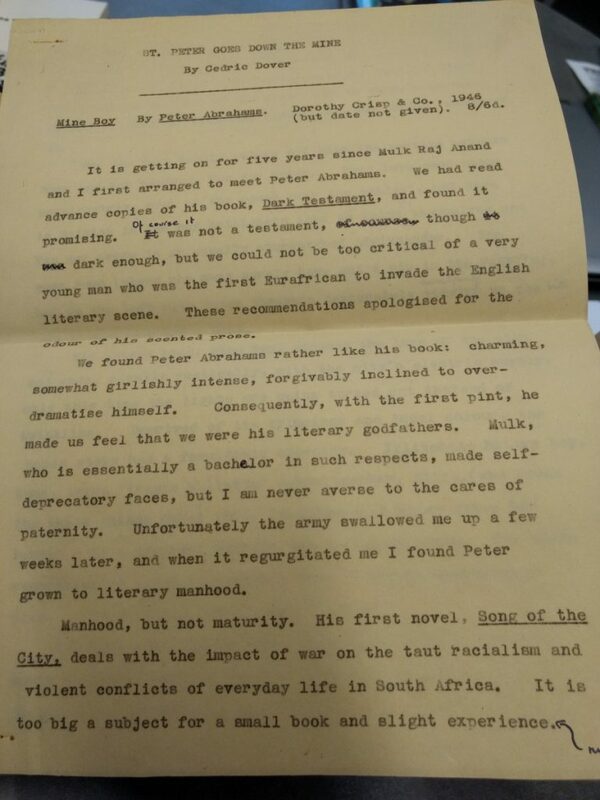 Peter Abraham is only one example of the endless list of South Africa available in the Rose Library. Key materials on this country come from the Cedric Dover Library, Raymond Danowski Poetry Library, and via other collections. Cedric Dover’s review of Peter Abraham’s Mine Boy- St. Peter Goes Down the Mine. Through songs, music, novels, poetry, biographies/autobiographies, and anthropological publications the Rose Library has succeeded in collecting page-turners which would make a visit to the library worth every effort.